A 19-square-mile (50 sq km) chuck of ice shelf broke off from Canada’s Ellesmere Island in the northern Arctic, reports the Associated Press. The Manhattan-sized ice shelf is now adrift in the Arctic Ocean. 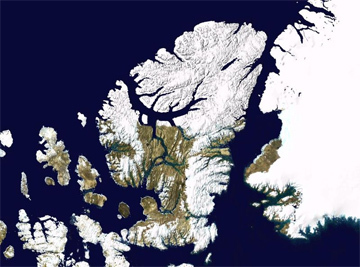 It is the largest of more than 83 sq mi (214 sq km) of ice shelf that has broken up in the Canadian Arctic this year. Researchers say disappearing sea ice and unusually warm temperatures are driving the disintegration of the ice shelf this year. Ellesmere Island in the Canadian arctic. NASA blue marble data, collecter using NASA World Wind. “Reduced sea ice conditions and unusually high air temperatures have facilitated the ice shelf losses this summer” explained Dr. Luke Copland, Director of the Laboratory for Cryospheric Research at the University of Ottawa. “And extensive new cracks across remaining parts of the largest remaining ice shelf, the Ward Hunt, mean that it will continue to disintegrate in the coming years”. Overall more than 90 per cent of Canada’s ice shelves have been lost over the past century. While most of this loss occurred during during a warm period in the 1930s and 1940s, temperatures in the Arctic are now even higher and ice shelf break-up has resumed since 2002.